[T1] Sandeep Bhat, "SEPARATION, DENOISING, AND RECONSTRUCTION OF 4D EMBRYONIC CARDIAC MICROSCOPY DATASETS FOR IMPROVED VISUALIZATION AND FLOW ANALYSIS." Ph.D Thesis, Mar 2013. [J2] Sandeep Bhat, Jungho Ohn, Michael Liebling “MOTION-BASED STRUCTURE SEPARATION FOR LABEL-FREE, HIGH-SPEED, 3D CARDIAC MICROSCOPY,” IEEE Transactions on Image Processing, Vol. 21, Issue 8, August, 2012. Virtual Journal for Biomedical Optics, Vol. 5, Issue 1, January, 2010. Optics Letters, Vol. 34, Issue 23, pp. 3704-3706, December, 2009. 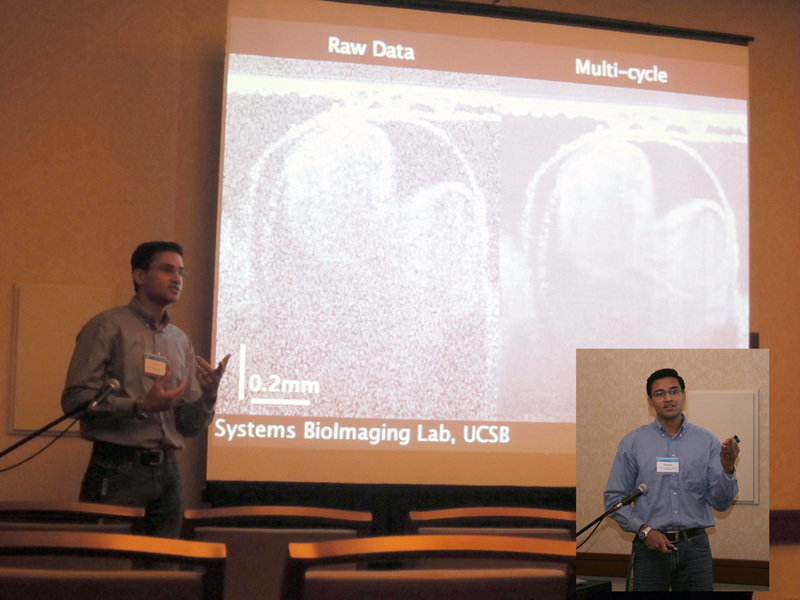 [C2] Michael Liebling, Sandeep Bhat, Jungho Ohn, “MULTISCALE, MULTIMODAL, AND MULTIDIMENSIONAL MICROSCOPY OF CARDIAC DEVELOPMENT,” 2010 IEEE Workshop on Signal Processing Systems, San Francisco Bay Area, CA, USA, Oct, 2010. 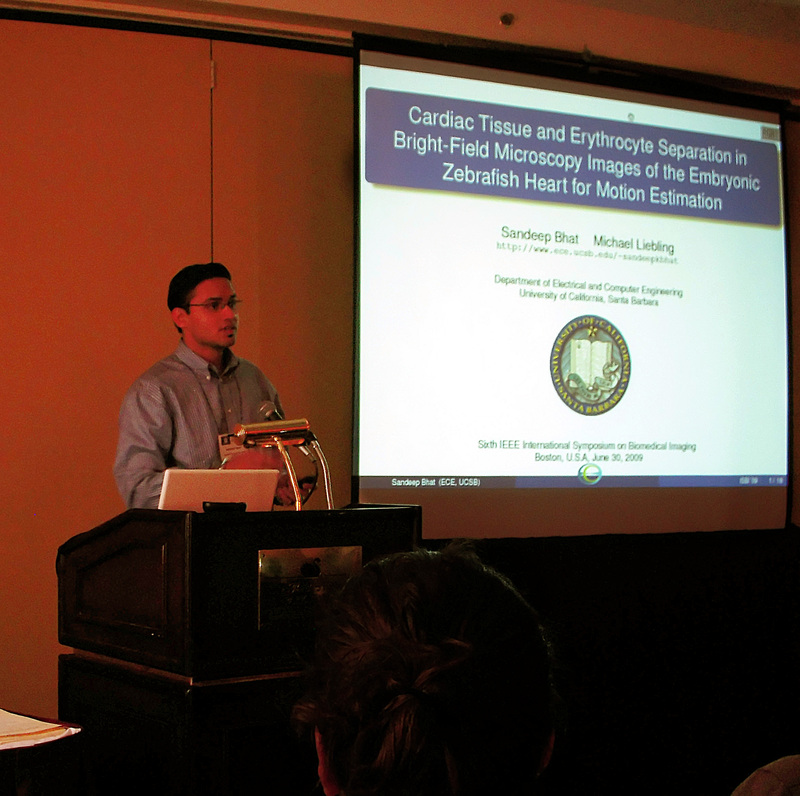 [C1] Sandeep Bhat, Michael Liebling, "CARDIAC TISSUE AND ERYTHROCYTE SEPARATION IN BRIGHT-FIELD MICROSCOPY IMAGES OF THE EMBRYONIC ZEBRAFISH HEART FOR MOTION ESTIMATION", 6th IEEE International Symposium on Biomedical Imaging (ISBI’09), Boston, MA, July, 2009. 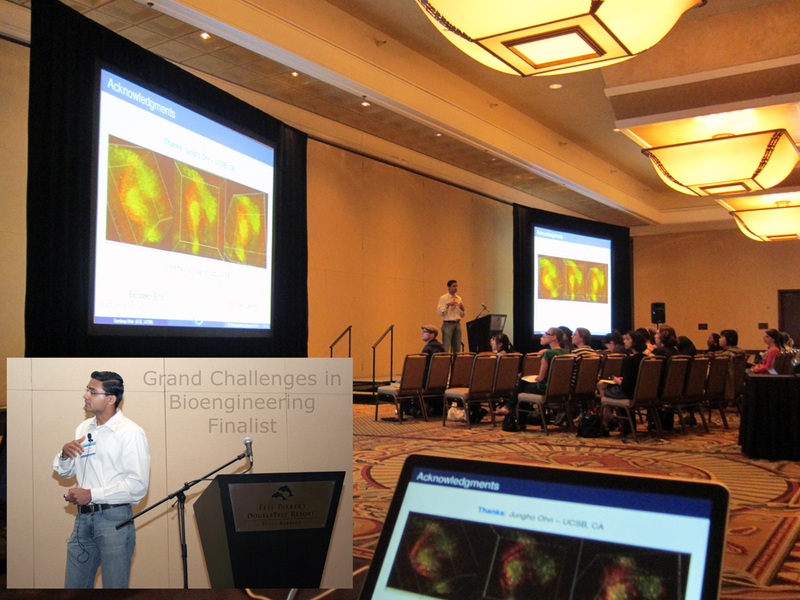 [P2] Sandeep Bhat, Michael Liebling, "IMPROVING SPECIFICITY IN BRIGHT-FIELD MICROSCOPY IMAGES OF THE BEATING EMBRYONIC HEART VIA MOTION-BASED SEPARATION" Oral Presentation. 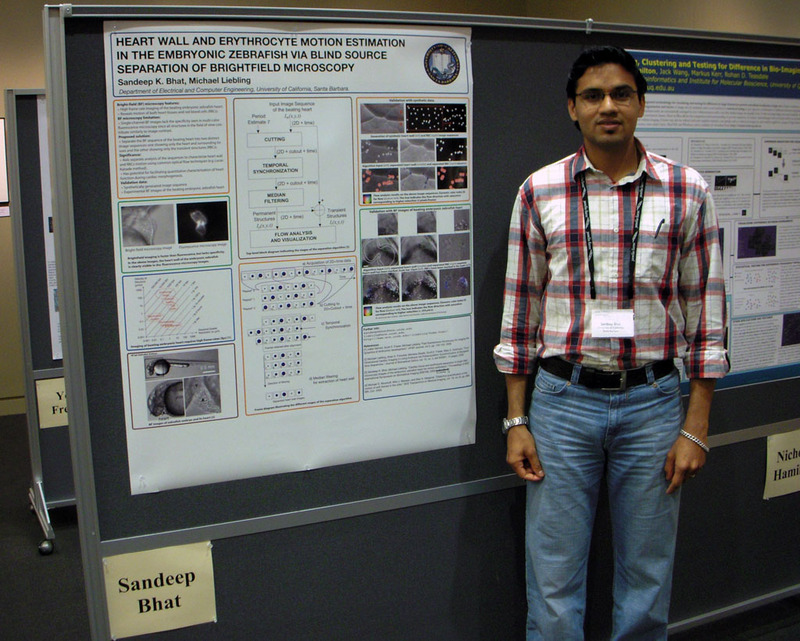 12th Annual UC Systemwide Bioengineering Symposium, Santa Barbara, CA, 2011. 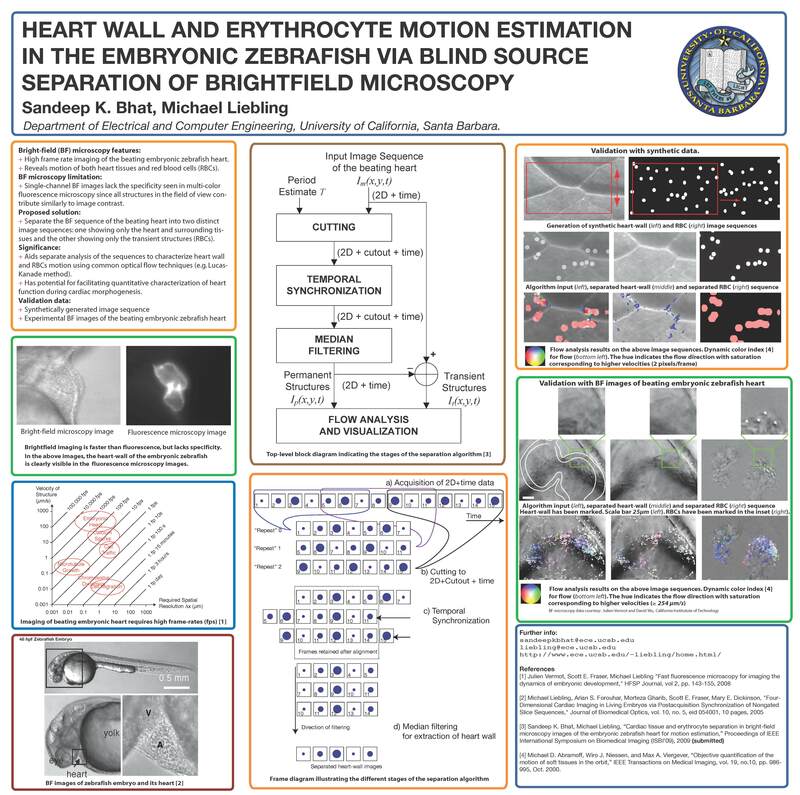 [P1] Sandeep Bhat, Michael Liebling, "HEART WALL AND ERYTHROCYTE MOTION ESTIMATION IN THE EMBRYONIC ZEBRAFISH VIA BLIND SOURCE SEPARATION OF BRIGHTFIELD MICROSCOPY" Poster presentation. BioImage Informatics Conference, Janelia Farms HHMI, VA, April, 2009. Tools and resources I used for creating this website.